The Niger Bend refers to a geographic region of West Africa — the area in which we buy most of our products. Our greatest love are one-of-a-kind, finest-quality ethnographic pieces that we discover in our travels. 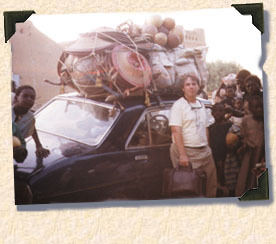 We have been trading under the name The Niger Bend since 1982. Almost all of the items we sell, we have bought personally. We travel to West Africa frequently to buy and to visit our old trading friends. It is through our many friendships that we have learned to love the peoples and cultures of the area. The highlighted countries are those from which we import the majority of our products and are the parts of the Continent that we know best. 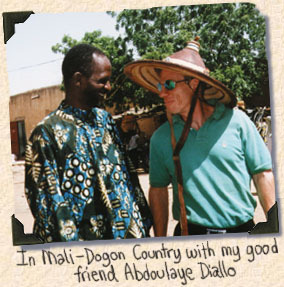 David on an earlier trip through Mali, accumulating great art to bring back home for the American market. He always attracts a friendly crowd, anxious to see what this foreign guy is doing so far from home. Just arrived home to Virginia from my first trip to Africa. We were in Niger with a group of women who were working with local primary schools and orphanages as well as with a women’s sewing school. I understand why you love the culture and the people of the region! And I love that you’ve established a way to share their art with a larger, worldwide audience. We are just at the start of looking to find a way to help the sewing school sell their items to a larger market. From your website, I see that you specialize in antiques and one-of-a-kind pieces, but given that you’ve done work in the region, wondered if you know of anyone who already has a means to sell (resell) handmade African skirts, dresses, headwraps, etc.? The school we visited is bringing girls out of prostitution and teaching them a trade. They have a waiting list, and teachers prepared to volunteer, but not the money to expand. I realize this doesn’t exactly fall into what you do with regards to African Art, but any advice you could give us on where to start to help this community of women would be greatly appreciated! Hi Jen, Thank you for your message and for thinking of us. I am sorry I did not answer sooner but I don’t really have any suggestions for you immediately but I will see what I can do and let you know. I didn’t want to hold off answering you too long. As soon as I can think of something I’ll let you know.